Murray Bookchin (January 14, 1921 – July 30, 2006) was an American libertarian socialist author, orator, and philosopher. A pioneer in the ecology movement, Bookchin was the founder of the social ecology movement within anarchist, libertarian socialist and ecological thought. He was the author of two dozen books on politics, philosophy, history, and urban affairs as well as ecology. In the late 1990s he became disenchanted with political Anarchism and founded his own libertarian socialist ideology called Communalism. Bookchin was born in New York City to the Russian Jewish immigrants Nathan Bookchin and Rose (Kaluskaya) Bookchin. He grew up in the Bronx, where his grandmother, Zeitel, a Socialist Revolutionary, imbued him with Russian populist ideas. After her death in 1930, he joined the Young Pioneers, the Communist youth organization (for children 9 to 14)  and the Young Communist League (for older children) in 1935. He attended the Workers School near Union Square, where he studied Marxism. In the late 1930s he broke with Stalinism and gravitated toward Trotskyism, joining the Socialist Workers Party. In the early 1940s he worked in a foundry in Bayonne, New Jersey where he was an organizer and shop steward for the United Electrical Workers as well as a recruiter for the SWP. Within the SWP he adhered to the Goldman-Morrow faction, which broke away after the war ended. He was an auto-worker and UAW member at the time of the great General Motors strike of 1945-46. With the failure of the proletariat to fulfil the revolutionary role in which Marxism had cast it, Bookchin realized that the working class was not a revolutionary force and broke with Marxism-Leninism. From 1947 he collaborated with a fellow lapsed Trotskyist, the German expatriate Josef Weber, in New York in the Movement for a Democracy of Content, a group of 20 or so post-Trotskyists who collectively edited the periodical Contemporary Issues. Now that scientific socialism (aka Marxism) had failed, CI embraced utopianism. CI-ers believed that previous attempts to create utopia had foundered on the necessity of toil and drudery; but now modern technology had obviated the need for human toil—a liberatory development. To achieve this "post-scarcity" society, Bookchin developed a theory of ecological decentralism. The CI magazine published Bookchin's first articles, including the pathbreaking "The Problem of Chemicals in Food" (1952). In 1958 Bookchin defined himself as an anarchist, seeing parallels between anarchism and ecology. His first book, Our Synthetic Environment, was published under the pseudonym Lewis Herber in 1962, a few months before Rachel Carson's Silent Spring. The book described a broad range of environmental ills but received little attention because of its political radicalism. In 1969-70 he taught at Alternate U, a countercultural radical school based on Fourteenth Street in Manhattan. 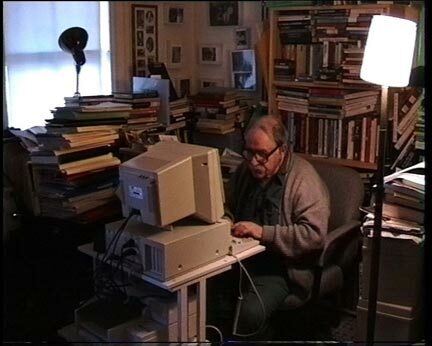 He was hired by Goddard College in the fall of 1973 to lecture on technology; his very popular lectures led to a teaching position and to the creation of the Social Ecology Studies program in 1974 and the Institute for Social Ecology soon thereafter, of which he became the director. In 1974 he was hired by Ramapo College in Mahwah, New Jersey, where he quickly became a full professor. The ISE was a hub for experimentation and study of appropriate technology in the 1970s. In 1977-78 he was a member of the Spruce Mountain Affinity Group of the Clamshell Alliance. Also in 1977 he published The Spanish Anarchists, a history of the Spanish anarchist movement up to the revolution of 1936. During this period, Bookchin forged some ties with the nascent libertarian movement. "He spoke at a Libertarian Party convention and contributed to a newsletter edited by Karl Hess. In 1976 he told a Libertarian activist that 'If I were a voting man, I'd vote for MacBride' — LP nominee Roger MacBride, that is." In 1980 he resigned as ISE director, and upon his retirement from Ramapo in early 1983, he moved to Burlington, Vermont. There, while continuing to write, he put his political ideas into practice by working with groups that opposed a wood chip plant, a trash incinerator, a condo development on the Lake Champlain waterfront, and a luxury marina. To foster face-to-face democracy, he helped create Burlington's neighborhood assemblies. In 1982 his book The Ecology of Freedom had a profound impact on the emerging ecology movement, both in the United States and abroad. His lectures in Germany influenced some of the founders of the German Greens. He was a principal figure in the Burlington Greens in 1986-90, an ecology group that ran candidates for city council on a program to create neighborhood democracy. In From Urbanization to Cities (originally published in 1986 as The Rise of Urbanization and the Decline of Citizenship), Bookchin traced the democratic traditions that influenced his political philosophy and defined the implementation of the libertarian municipalism concept. A few years later The Politics of Social Ecology, written by his partner of 20 years, Janet Biehl, briefly summarized these ideas. In 1987, as the keynote speaker at the first gathering of the U.S. Greens in Amherst, Massachusetts, Bookchin initiated a critique of deep ecology, indicting it for misanthropy, neo-Malthusianism, biocentricism, and irrationalism. A high-profile deep ecologist Dave Foreman of Earth First! had recently said that famine in Ethiopia represented "nature taking its course," nature self-correcting for human "overpopulation." Bookchin was much criticized for the impassioned tone of his criticism, which clashed with New Age sensibility, but only dyed-in-the-wool Earth First! misanthropes defended Foreman's remark. In 1995 Bookchin lamented the decline of American anarchism into primitivism, anti-technologism, neo-situationism, individual self-expression, and "ad hoc adventurism," at the expense of forming a social movement. Bookchin "describe[d] himself as a 'social anarchist' because he look[ed] forward to a (gentle) societal revolution [and] lit out after those whom he term[ed] 'lifestyle anarchists.'" The publication of "Social Anarchism or Lifestyle Anarchism" in 1995, criticizing this tendency, was startling to anarchists. Thereafter Bookchin concluded that American anarchism was essentially individualistic and broke with anarchism publicly in 1999. He placed his ideas into a new political ideology: Communalism (spelled with a capital "C" to differentiate it from other forms of communalism), a form of libertarian socialism that retains his ideas about assembly democracy and the necessity of decentralization of settlement, power/money/influence, agriculture, manufacturing, etc. In addition to his political writings, Bookchin wrote extensively on philosophy, calling his ideas dialectical naturalism. The dialectical writings of Hegel, which articulate a developmental philosophy of change and growth, seemed to him to lend themselves to an organic, even ecological approach. Although Hegel "exercised a considerable influence" on Bookchin, he was not, in any sense, a Hegelian. His later philosophical writings emphasize humanism, rationality, and the ideals of the Enlightenment. His last major published work was The Third Revolution, a four-volume history of the libertarian movements in European and American revolutions. Social ecology is based on the conviction that nearly all of our present ecological problems originate in deep-seated social problems. It follows, from this view, that these ecological problems cannot be understood, let alone solved, without a careful understanding of our existing society and the irrationalities that dominate it. To make this point more concrete: economic, ethnic, cultural, and gender conflicts, among many others, lie at the core of the most serious ecological dislocations we face today—apart, to be sure, from those that are produced by natural catastrophes. Starting in the 1970s, Bookchin argued that the arena for libertarian social change should be the municipal level. In a 2001 interview he summarized his views this way: "The overriding problem is to change the structure of society so that people gain power. The best arena to do that is the municipality — the city, town, and village — where we have an opportunity to create a face-to-face democracy." In 1980 Bookchin used the term "libertarian municipalism", to describe a system in which libertarian institutions of directly democratic assemblies would oppose and replace the state with a confederation of free municipalities. Libertarian municipalism intends to create a situation in which the two powers—the municipal confederations and the nation-state—cannot coexist. Its supporters—Communalists—believe it to be the means to achieve a rational society, and its structure becomes the organization of society. While critical of various aspects of Israeli policy - particularly that of the Conservative Likud governments - Bookchin also focused on Arab aggression against the fledgling Jewish state. In a 1986 article he criticized the Far Left's focus on Israel and its ignoring of human rights elsewhere in the region, Arab atrocities against Jews, Palestinian calls for the "annihilation" of Jews, and Israeli efforts to prevent the Palestinian Arabs from fleeing in the aftermath of the Israeli War of Independence. ^ John Muir Institute for Environmental Studies, University of New Mexico, Environmental Philosophy, Inc, University of Georgia, ‘‘'Environmental Ethics’’’ v.12 1990: 193. ^  Biehl, Janet. ‘’Bookchin Breaks with Anarchism’’. ‘’’Communalism’’’ October 2007: 1. ^ “Attacks on Israel Ignores the Long History of Arab Conflict,” published by Murray Bookchin in The Burlington Free Press, 1986. E. Castano, Ecologia e potere. Un saggio su Murray Bookchin, Mimesis, Milano 2011 ISBN 978-88-5750-501-5. Black, Bob. Anarchy After Leftism (C.A.L. Press, 1997). A reply to Social Anarchism or Lifestyle Anarchism.